As Andrew Orlowski points out, the new iPod Touch (the iPhone without the phone bit) is, on paper at least, an overpriced, locked-down PDA and one without any games or even an email client for when you’re on WiFi. It is also, however, the only piece of consumer electronics on the market today that will without fail turn grown men and women into delighted children. In the five days since I bought it at Apple’s Regent Street store, everyone who’s taken the little black gizmo for a spin has ended up staring in disbelief, wide-eyed, slack-jawed and saying ‘wow’ a lot. Think how amazed you were when you first saw the tiny nano, and multiply it by a hundred. One colleague, a little carried away in the moment and flicking through photos asked whether you could put music on it. How does it achieve this? Obviously it comes in a very good looking case – all of the chrome of the original iPod, the front panel almost entirely a large and bright screen and wafer-thin. However it is the software which amazes, and in particular, the multi-touch interface. By – just about – managing to get the interface to respond in real time and introducing many levels of immediate functional mapping, Apple has made standard handset interface look decades out of date. It’s as revolutionary as the effect that Apple’s first GUI had on the DOS prompt. (Above: An add Macintosh ran to congratulate Windows on the tenth anniversary of Windows 95). The opportunities presented by a malleable, multi-input screen are enormous, as we’ve seen a number of times with Jeff Haan’s demos. Apple’s actually been very retrained in their use of it, presumably on the grounds that people will need to follow a learning curve of some sort. However the interface is almost entirely intuitive with very few people needing even an introduction to the concept. 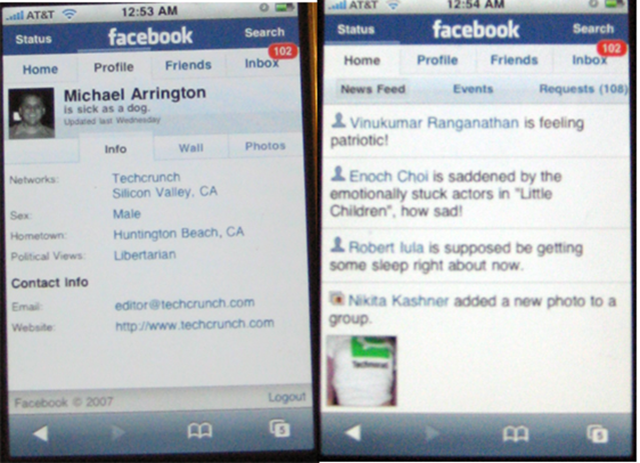 To start to see some of the potential of this new way of thinking, and how the relatively small screen size of the iPod Touch can be best put to use, we need only look to Facebook’s iPhone interface, which is an absolute joy to use. 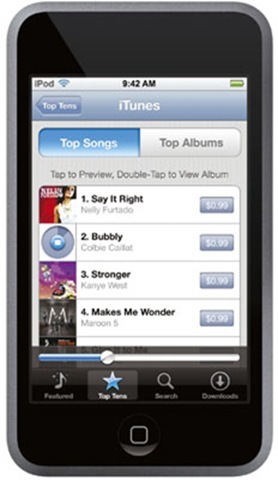 Perhaps 2008, at last really will be the long-awaited “year of the mobile”.